Verdi’s Falstaff mirrors the two buses scenario for me this year. Up until now I haven’t caught a production of this well-loved opera since Glyndebourne came to my home city of Norwich in 2009. However, I gladly greeted 2018 in by attending a good production by Opera Vlaanderen in Antwerp directed by Christoph Waltz [see Tony's review] and now this brand-new production in Berlin, directed with Italianate flair by the Napoli-born film director, Mario Martone, forming part of Daniel Barenboim’s Festtage, an Eastertide festival for Berliners and visitors alike and one that I simply cherish like no other. On Wednesday 28 March 2018 at the Staatsoper Berlin, I heard Michael Volle as Falstaff, with Alfredo Daza, Francesco Demuro, Barbara Frittoli, Daniela Barcellona, Nadine Sierra, and Katharina Kammerloher. 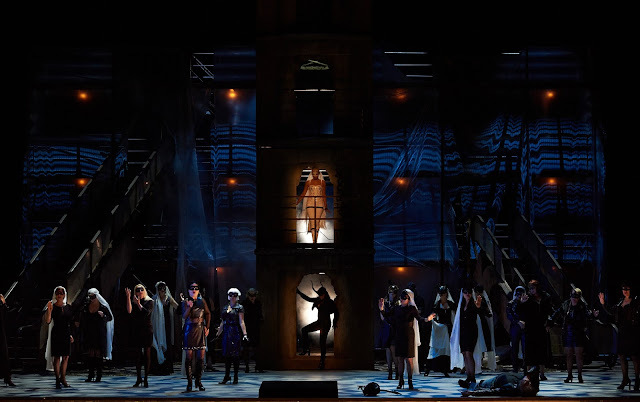 The well-loved opera is loosely based on Shakespeare’s The Merry Wives of Windsor by Arrigo Boito as well as scenes from Henry IV (parts I & II) and written when Verdi was approaching the ripe old age of 80. It turned out to be his second comedy and his third work based on a Shakespeare play following those of Macbeth and Othello. 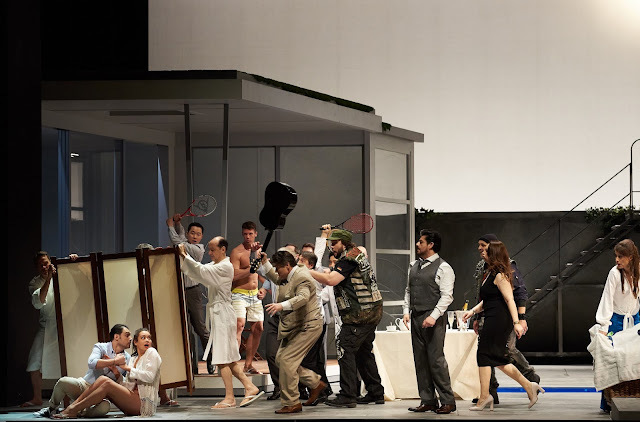 However, there are none of the long, passionate melodies in Falstaff that one comes across in La traviata or for that matter, Il trovatore, but, nonetheless, the opera’s filled with wit and high spirits that can be found almost in every bar thereby making it so pleasurable all round. The action revolves round the thwarted and sometimes farcical efforts of the fat-old knight of Windsor, Sir John Falstaff, who at one time acted as the dashing young page to the Duke of Norfolk. Therefore, I guess he must have visited Norwich at some point. However, his herculean efforts to seduce two married women to gain access to their husbands’ wealth finishes up where one can only expect it to finish. 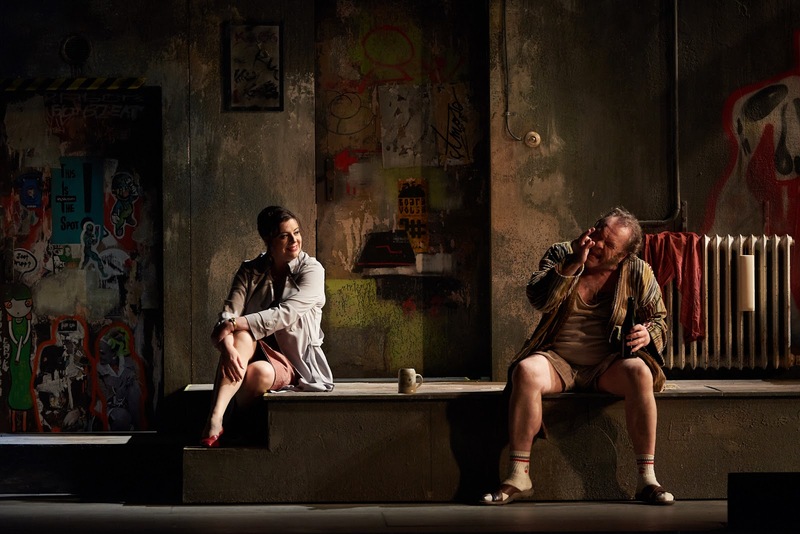 But in this production the fat-old knight no longer fits that description as in Martone’s highly-entertaining, stylish and contemporary production, Falstaff comes in the guise of a slim-looking (to a degree!) rock-style old hippy kitted out in biker’s gear sporting a leather jacket and looking a bit scruffy with unkempt hair and ragged sideburns. It’s unimaginable to think that such refined and well-to-do ladies as Mrs Alice Ford and Mrs Meg Page would want anything to do with the scoundrel. But a bit of rough trade, I suppose, fits the bill in this instance. And Falstaff’s old stamping-ground, The Garter Inn, is now represented by a drinking den extravagantly named the Panoramic Bar, a rather seedy local with its name punctuated by italicised lettering blazoned across the door in shocking-pink neon. Located in an unfashionable part of town (where else!) 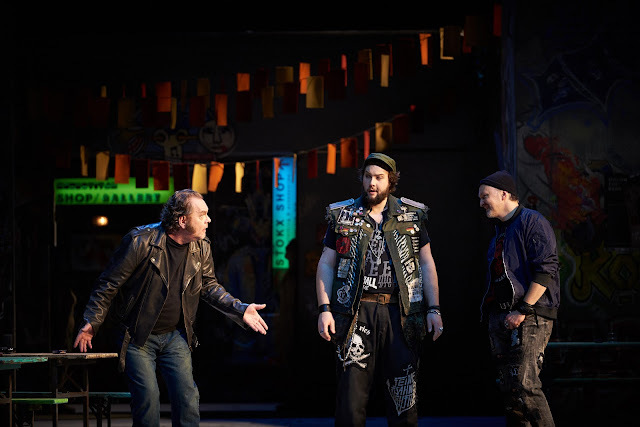 the haunt’s favoured by all and sundry and here Falstaff reigned supreme in tow with his boozing pals, Bardolfo and Pistola, well played and acted by Stephan Rügamer and Jan Martiník. 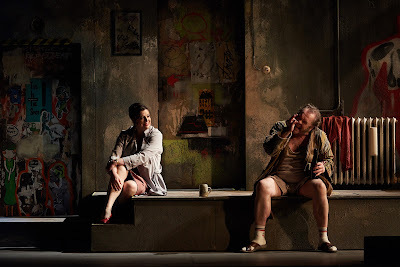 Wildly dressed, they proved a rich and entertaining deuce and bounced off each other amusingly well while the portrayal of Mrs Quickly was brilliantly executed and played with zest and bags of charm by Daniela Barcellona whose deep mezzo voice was simply wonderful. Cunning, manipulative and crafty as befits her role, she came over as a well-dressed and astute modern businesswoman always one jump ahead of Falstaff and, indeed, everyone else for that matter. And Barbara Frittoli and Katharina Kammerloher as Mrs Alice Ford and Mrs Meg Page played their roles to the full. And when the trio of women get together they proved a formidable and powerful force delivering the goods not only from a musical point of view but also from a feminist standpoint, too. Equality of the sexes was most certainly the order of the day and the women were dictating the agenda. In contrast to the rather shabby, graphitised, environment that Falstaff and his bawdy pals lived in, Mr and Mrs Ford, at the opposite end of the social scale, resided in opulent surroundings and deep-seated comfort exercising social manners as befitting their status in society. They might as well have been in a gated community as their property was well protected by a substantially-built brick-wall to keep the riff-raff out. Their overtly-contemporary living space was well equipped with such luxuries that wealth bestows upon one such as a gym and a swimming-pool (L-shaped, the latest fashion!) and, to boot, a servant while Mrs Ford (not Mr Ford) was seen checking out the markets in what proved a subtle scene skimming the pages of The Financial Times. There were so many good scenes in this production but none more so than the well-loved scene in Windsor Park where poor old Falstaff - the role superbly played and acted supremely well by the powerful German baritone, Michael Volle, a well-respected Wagnerian singer especially in the challenging role of Wotan - is ridiculed in the darkness of the night as the antlered Black Hunter to woo the Merry Wives of the parish by the famed Herne oak, named after the legendary huntsman. But the setting was miles away from the traditional idyllic forest clearing of the libretto and looked more akin to a fire-fighters’ compartmentalised training tower but with escalators either side of it maybe it represented a former departmental store. Who knows? Nonetheless, the set was ingeniously designed by Margherita Palli, whose sets fitted well the overall stage plan of the director. However, the so-called forest was a ripe and risqué area where people of the night gathered incognito for fun and games with couples (and threesomes, too) moving in and out of the shadows enjoying themselves to the limit simulating sexual acts in a most perverse and unconventional manner that left nothing to the imagination. The girls were turned out erotically dressed in black latex gear (designed by Ursula Patzak) and wouldn’t look out of place in a burlesque show. 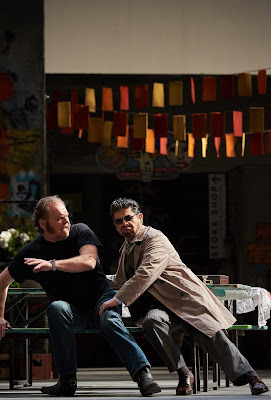 Alfredo Daza (a popular singer of Staatsoper Berlin) put in a wonderful performance as Ford singing the role with total conviction while Francesco Demuroa’s interpretation of Fenton was particularly desirable and Nadine Sierra’s reading of Nannetta was one to chalk up. Her crystal-clear soprano voice sparkled like the evening star and was heard to good effect in the final scene while Jürgen Sacher’s portrayal of Mrs Quickly’s servant, Dr Cajus, was admirable to say the least especially in the opening scene in which he’s duped by Falstaff and his lovable cronies in a rowdy drinking session. It’s a great opera with a fairy-tale ending as in the final scene conjuring up the magic of the night everyone’s reconciled. Falstaff extravagantly proclaims that the world’s nothing more than a jest and a good hearty laugh is agreeably shared by one and all. And Verdi ends his long and glorious operatic career with a magnificent fugue in nine parts which was brilliantly performed with the dynamo of the pit, Daniel Barenboim, firmly in control. And Maestro Barenboim’s conducting was, as usual, bright and tightly controlled and he paid strict attention to detail to the performers while members of Staatskapelle Berlin were alert to his every whim. Full credit must go to Martin Wright, too, who dutifully trained the Staatsopernchor to a high level of performance which clearly showed in the final act of a very pleasing and satisfying new production of Verdi’s Falstaff. One last point, though! Overall, I enjoyed Mario Martone’s production, staged as in Antwerp in modern dress, but in Christoph Waltz’ direction he conjured up a bit more of the aristocratic nature of Sir John Falstaff and brought out more of the quirky side to his character. This aspect of Falstaff - who had breeding and was a knight of the realm - was somewhat lacking in Martone’s production.